There’s no shame in having a little bourbon for breakfast, right? At least in this case, where it’s baked into banana bread. Then again, you may prefer this bread for a late afternoon snack with coffee or even dessert because it’s sweet, and you can really taste the bourbon. It’s so strong I’m not sure you should drive after eating it. But seriously, I do recommend this recipe. Preheat the oven to 350 F and spray a 9×5 inch or slightly smaller loaf pan with flour-added cooking spray. Combine the flour, baking soda, baking powder and salt in a bowl and stir well to mix. In a mixing bowl, using an electric mixer, beat the oil, sugar and vanilla until well mixed. Add the egg and beat until light, then reduce mixer speed and beat in the mashed banana and bourbon. By hand, stir in the flour mixture and the water just until mixed. Pour the batter into the pan and bake for 45 minute. 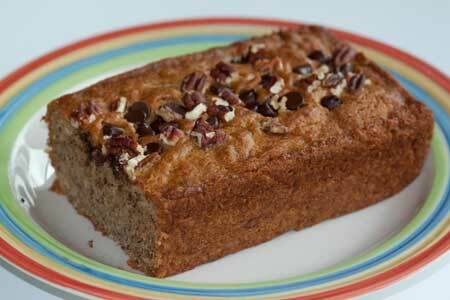 If you like, sprinkle nuts and chocolate chips down the center of the loaf before baking. Let cool for about 20 minutes, then carefully remove from the pan. Yum! This is my kind of breakfast :). No shame in Bourbon for breakfast at all– not in this case anyway! The recipe looks awesome. Probably, but the tops might be kind of flat. The bread didn’t have a big dome. This banana bread looks great. I don’t have any bourbon. Do you think it would work with Kahlua? Coffee and Banana aren’t a bad combo, right? I might take up drinking if I can get it in banana bread! Your bread looks perfect. Mine almost always sink in the middle or turn out dry. lol 1/2 cup of bourbon! love it.